A cable thumper is basically a portable high voltage surge generator. It is used to inject a high voltage DC surge (about 25 kV) into the faulty cable. If you supply a sufficiently high voltage to the faulty cable, the open-circuit fault will break down creating a high-current arc. This high current arc makes a characteristic thumping sound at the exact location of the fault. To find the location of cable fault using the thumping method, a thumper is set to thump repeatedly and then walking along the cable route to hear the thumping sound. The higher the dc voltage applied, the louder will be the resulting thump. This method is useful for relatively shorter cables. For longer cables, the thumping method becomes impracticable (imagine walking along a cable that runs several kilometers to hear the thump). A major advantage of cable thumping is that it can locate open circuit faults very accurately. Also, this method is easy to apply as well as easy to learn. Though the thumping method provides very accurate fault location, it has its own drawbacks. Applying this method for longer cables is extremely time-consuming. It may take hours or even days to walk along the cable to locate the fault. Moreover, during that time, the cable is exposed to high voltage surges. So while the existing fault is located, the high voltage surges may weaken the insulation of the cable. If you are proficient in cable thumping, you can limit the damage to the cable insulation by reducing the power sent through the cable to the minimum required to conduct the test. While moderate thumping may not cause noticeable damage, frequent thumping may degrade the cable insulation to an unacceptable condition. Also, this technique can not find faults that do not arc-over (i.e. short circuit faults). A Time Domain Reflectometer (TDR) sends a short-duration low energy signal (of about 50 V) at a high repetition rate into the cable. This signal reflects back from the point of change in impedance in the cable (such as a fault). TDR works on the similar principle as that of a RADAR. A TDR measures the time taken by the signal to reflect back from the point of change in impedance (or the point of fault). The reflections are traced on a graphical display with amplitude on y-axis and the elapsed time on x-axis. The elapsed time is directly related to the distance to the fault location. If the injected signal encounters an open circuit (high impedance), it results in high amplitude upward deflection on the trace. While in case of a short-circuit fault, the trace will show a high amplitude negative deflection. As a TDR sends a low energy signal into the cable, it causes no degradation of the cable insulation. This is a major advantage of using TDR to find the location of a fault in an underground cable. A TDR works well for open-circuit faults as well as conductor to conductor shorts. A weakness of TDR is that it cannot pinpoint the exact location of faults. It gives an approximate distance to the location of fault. Sometimes, this information alone is sufficient and other times it only serves to allow more precise thumping. When the TDR sends a test pulse, reflections that may occur during the time of outgoing test pulse may be obscured from the user. This can happen with the faults at near end and called as blind spots. Also, a TDR can not see high resistance (generally above 200 Ohms) ground fault. If there is surrounding electrical noise, it may interfere with the TDR signal. As the low-voltage TDR is unable to identify high resistance ground faults, its effectiveness in finding underground cable faults is limited. To overcome this limitation of TDR, following are some popular high voltage radar methods. (i) Arc reflection method, (ii) surge pulse reflection method and (iii) voltage decay reflection method. The arc reflection method uses a TDR with a filter and thumper. The thumper (or surge generator) is used to create an arc across the shunt fault which creates a momentary short-circuit so that the TDR can show a downward deflection effectively. The arc reflection filter protects the TDR from high voltage surge generated by the thumper and routes the low-voltage signal down the cable. 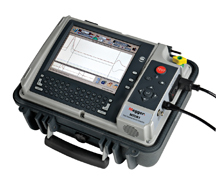 This method uses a current coupler, a thumper and a storage oscilloscope (analyzer). This method is used for long run cables and on faults that are difficult to arc over which do not show up using arc reflection method. In this method, a thumper is directly connected to the cable without a filter which can limit both the voltage and current applied to the fault. The thumper injects a high voltage pulse into the cable creating an arc at the fault, which subsequently causes a reflection of energy back to the thumper. The reflection repeats back and forth between the fault and the thumper till its energy gets depleted. The current coupler senses the surge reflections which are then captured and displayed by the storage oscilloscope. This method uses a voltage coupler, a dielectric test set (high-voltage dc test set or proof tester) and a storage oscilloscope (analyzer). This method is used for transmission class cables when the generation of arc at the fault requires breakdown voltage greater than that a typical thumper or surge generator can provide. Here, the voltage coupler senses the reflections produced by the flashover of dc voltage at the fault and the analyzer captures and displays them.